We are happy to announce that we will be running six lectures this season, in collaboration with Eyelevel Gallery!!! Since the beginning of the Lecture Series in 2008, the series has hosted approximately 100 speakers and over 700 audience members. 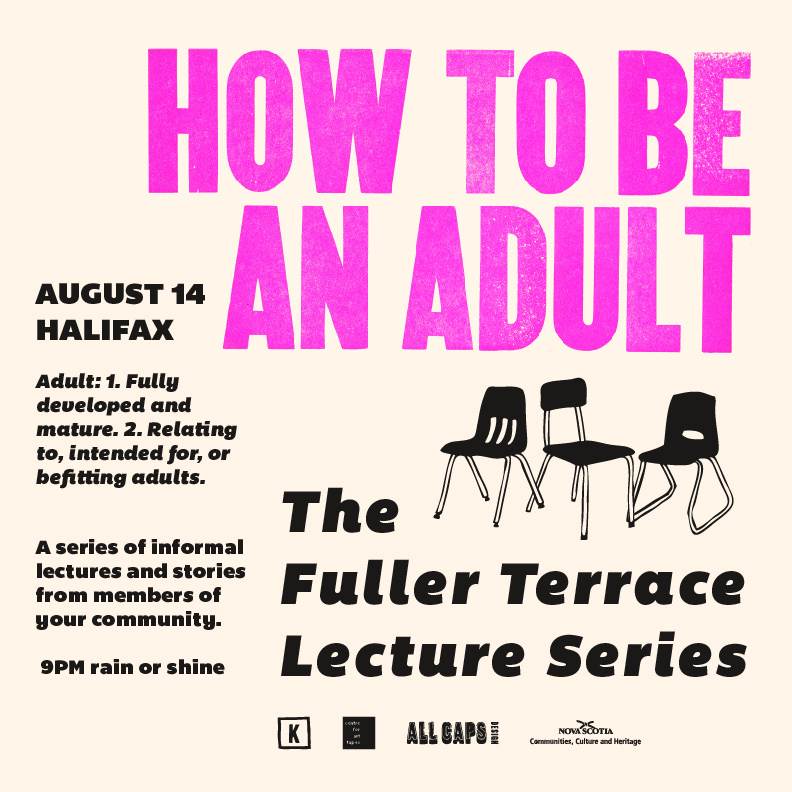 In the past, we have hosted the Lecture Series in the backyard of 2664 Fuller Terrace and in backyards around Nova Scotia. As always, the Lecture Series is held with the intention of bringing people together to share stories and experiences while building connections within a community. We perceive the 2014 season as an ideal opportunity to expand the traditional format. This year, we will be hosting lectures in two locations, three in Berlin at Studio Nihil Baxter: Stromstraße 11-17. 10551, and three in Halifax at Wonder’Neath Studio- 2891 Isleville Street. We will be kicking off the 2014 season on August 15th and running the lectures into October. Here is a list of the 2014 topics and dates. Are you technically an adult? What makes you feel like an adult? Do you floss? Do you do your taxes? Do you take your vitamins? Do you watch adult movies? We want stories about your journey into ‘adulthood’. Friday, August 15th, Berlin, 9pm. Tuesday, August 19th, Halifax, 9pm. A “perfect storm” is an expression that describes an event where a rare combination of circumstances will aggravate a situation drastically. The term is also used to describe an actual phenomenon that happens to occur in such a confluence, resulting in an event of unusual magnitude. For this lecture, we are looking for stories of your/a perfect storm. Friday, September 19, Berlin, 9pm. Tuesday, September 23, Halifax, 9pm. Stories that come out of the blue, the Ocean blue, feeling blue, or that happen once in a blue moon. Also about Yves Klein. Friday, October 17th, Berlin, 9pm. Tuesday, October 21st, Halifax, 9pm. All presentations must be 15 minutes in length- they can be fact, fiction, essays, artist talks, experiences, explanations and excuses. Please keep in mind we can do lectures by proxy and are happy to host lectures in both German and English….just send us an proposal… we will probably love it. A podium, sound equipment, and digital projector are available for use in both locations. 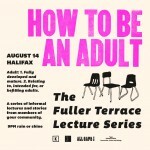 All lectures will be filmed and posted on our website, fullerlectures.com. To submit a proposal, email: fullershowandtell@gmail.com. Deadline for submissions is August 1st, 2014. We hope you find the prospect of conducting the lectures in Halifax and Berlin as exciting as we do. As it is our first year in Berlin, we would really love help spreading the word! On Thursday September 27th at 6pm, we’re having an event at 2125 Brunswick Street, hosted by the Center For Art Tapes. Since the start of 2012 we’ve been Curators in Residence at CFAT and on Thursday we’ll celebrate our website launch with a curatorial talk about what we’ve been up to. August 14th, 2664 Fuller Terrace at 9pm rain or shine.